One break-through design is the Frers MY78 motor yacht Bill and Me built by Baltic Yachts. The unique aspect of this design is the strong crossover she has between sail and powerboats” Says Mani Frers adding. “Our client was making the transition from sail to power, having previously sailed around the world, and now wanted the convenience of a power boat matched to the better sea keeping and comfort qualities of his yacht. The Frers MY78 hull form is more akin to a fast sailing yacht than the usual deep-V or displacement motor yacht. Like a yacht, the trim on this Baltic Frers MY78 does not change as speed increases. Hump speed – the point on a curve at which a hull jumps from displacement to semi-displacement or planing mode, is very smooth. 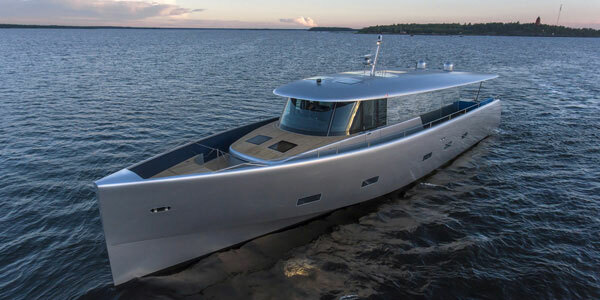 By combining high level design expertise with the latest technology like Seakeeper and Volvo Interceptor systems, the Frers MY78 motor yacht goes a considerable way towards eradicating seasickness all together and making life onboard a lot smoother.